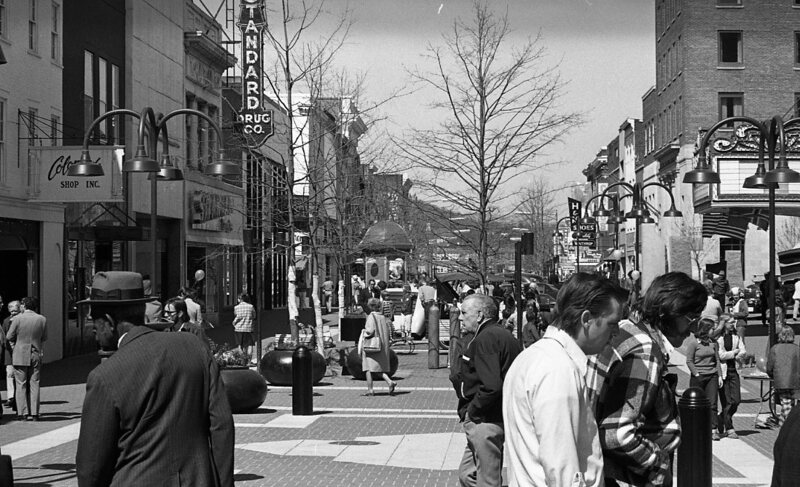 This photograph by Ed Roseberry shows the DTM in the early years of the brick-paved pedestrian mall. The willow oak trees are just getting established and some of the signage that hung along Main Street (dating to the 1950s and earlier) can still be seen here. Roseberry has documented downtown Charlottesville and UVA through his photography since the 1940s. Last year, DTM’s Dave McNair did this extensive piece on Roseberry for The Hook: [ http://www.readthehook.com/109735/ed ] Mr. Roseberry will be C’ville Images’ guest for slideshow presentations over the next couple of months. Check the website (www.cvileimages.com) for details. Vintage DTM is produced by C’ville Images.